This is one of the most trendsetting holiday apartments, capturing the hot exoticism of tropical lands. 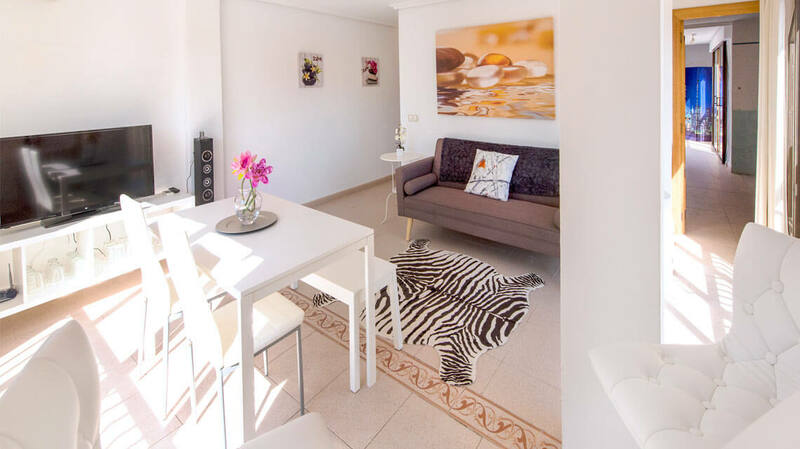 Choose this Benidorm rental for a snapshot of the Mediterranean Costa Blanca. This area certainly has the ‘wow factor’ and will impress holidaymakers from the world over! The generous proportions of this room leave you with plenty of choices too, from the stylish, two-seater high table to the elegant dining table. You are also sure to have plenty of light and sunshine flooding into the room, thanks to those glorious dual-aspect French windows. There are also some classic statement features like the zebra-patterned rug and the eye-catching floral throw over the sofa. 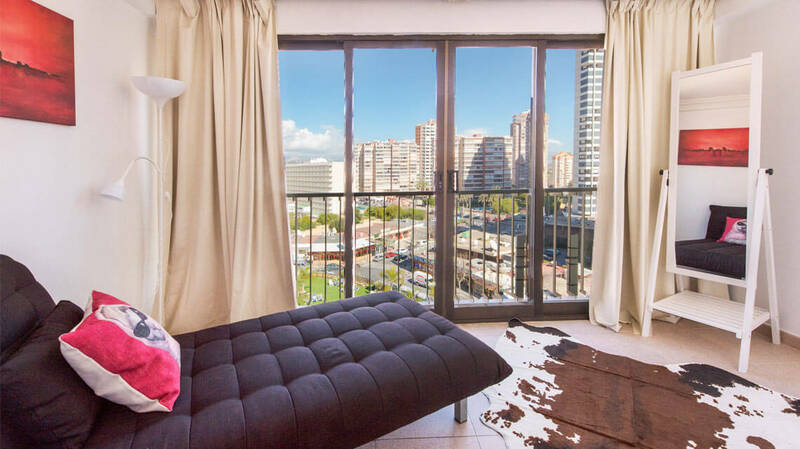 This living space has all the mod-cons you’d expect for a holiday in Benidorm, such as state-of-the-art speakers and an LED TV. A fantastically multi-functional space. 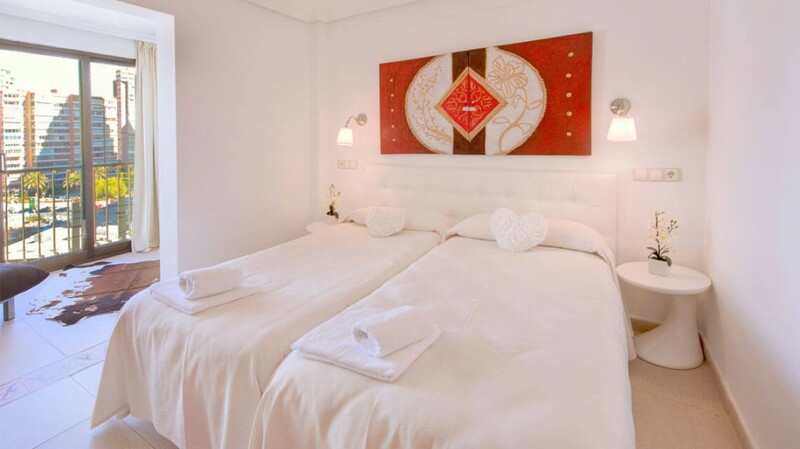 The theme of exotic lands continues in this well-situated double bedroom! Clean, white walls are enhanced by bold and beautiful touches such as artwork and animal-print rugs. Style combines with substance in this room as there is also wonderful wooden furniture, suitable for storing those essential holiday bits! 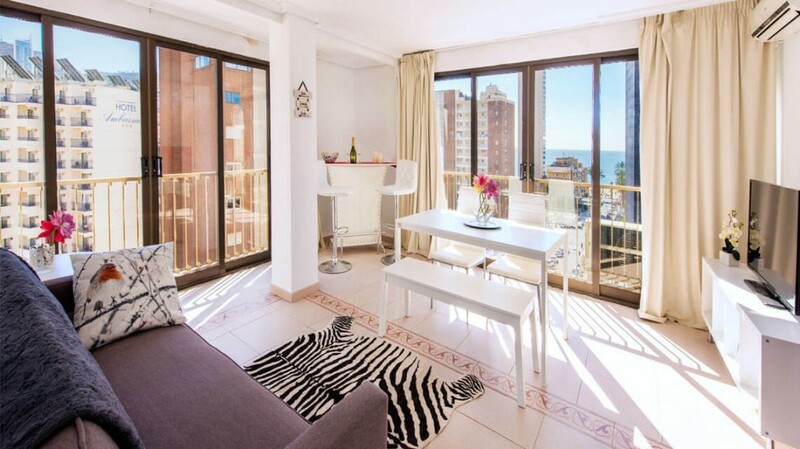 The alcove area with French windows is really impressive too, due to its breath-taking Spanish vistas. The black chaise-longue and floor-length mirror generate a touch of class; a great spot for whiling away the hours! 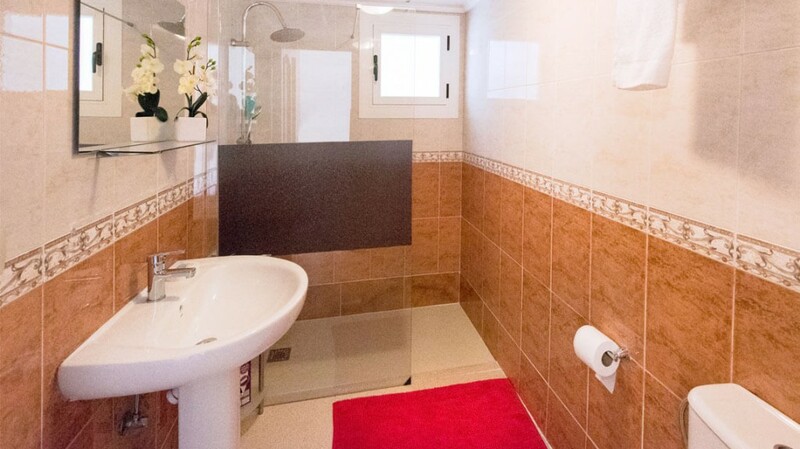 The tiled floor and French doors allow buckets of light and that warm Costa Blanca breeze to fill up this amazing boudoir. A classy twin bedroom featuring floral-inspired designs that craft a calming atmosphere. The white walls, first-rate furniture and bright lighting add to the style and elegance of this room. A comfortable space for unwinding. The contemporary bathroom, with its modern lighting, glistening tiles and artistic touches throughout, provides you with a luxurious haven. 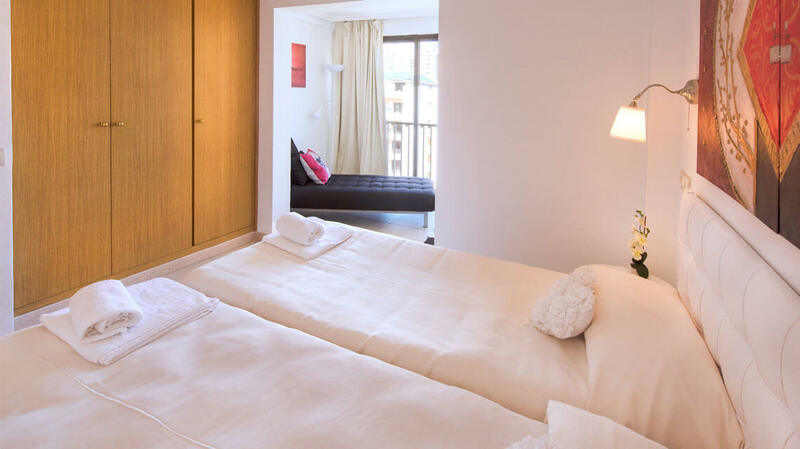 Indulge after a day at Levante beach in the brand new walk-in shower: towels and mats are provided. There is ample space in this galley-style, high-quality finished kitchen, complete with granite tops and tiled floors. 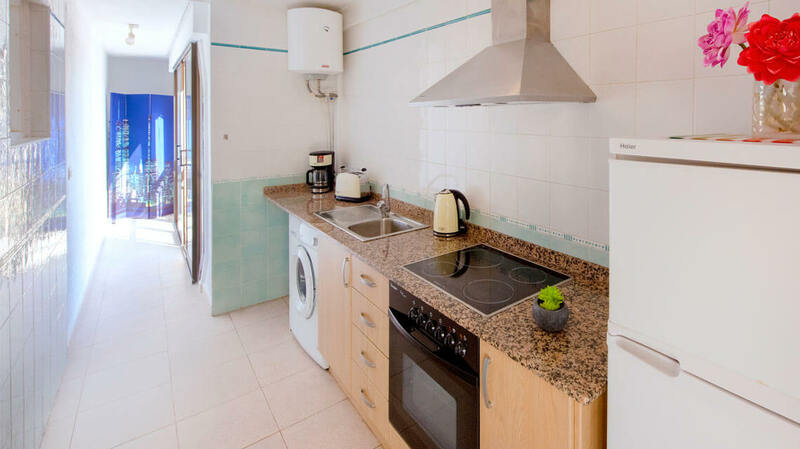 It is important to us that you have everything you need during your holiday in Spain, so all our My Pretty Payma holiday rentals include: fridge/freezer, oven/hob, kettle and washing machine, as well as crockery.